Another type of a final polisher, this machine gives a silky smooth finish and adds a shine to rice by the addition of water. This process also enhances the shelf-life of the product. 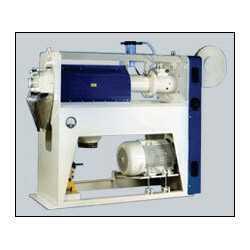 This machine can be used on raw as well as parboiled rice. With an industry experience of more than 2 decades, we are offering our clients with quality assured products. In our range, we offer Rice Plain Shifter, Rice Plain Shifter with Blower, Double Body Paddy Separator and Gravity Paddy Separator. Owing to our expert procurement agents, we are also meeting the demands of DE-Stoner, Combined Paddy Cleaner, Mobile Rice Mill, Rice Polisher, Silky Polisher, Rubber Sheller and Air Pressure Automatic Rubber Sheller. Our product range is in wide demand amongst our domestic clients based in Tamil Nadu, Andra Pradesh, Karnataka and Kerala. As a prominent organization, we offer products that are manufactured as per the defined quality standards. The products offered by us are appreciated for their durable finish standards, minimum maintenance and high efficiency. Further, we assure our clients with timely delivery of consignments and convenience in transactions.